News in over the weekend from Julien Elfenbein at Burger Yacht Sales that he's joined Compass International to list the classic 57m sailing yacht Fleurtje for sale. 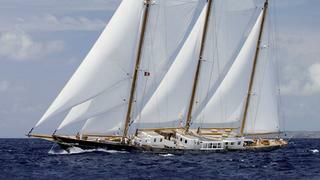 A three-masted staysail schooner, she was built in 1960 by Amsterdamsche Scheepswerf de Vries. Fleurtje has hydraulic sail handling systems and accommodates 14 guests in a master suite, four doubles and a twin cabin plus two Pullman berths. Under power, twin 624hp Caterpillar engines give her a range of 1,500 nautical miles at 10 knots. Lying near Athens, Greece, Fleurtje is asking €6.9 million.